Royal Caribbean posted a new video on Symphony of the Seas which is entering service in Spring 2018. 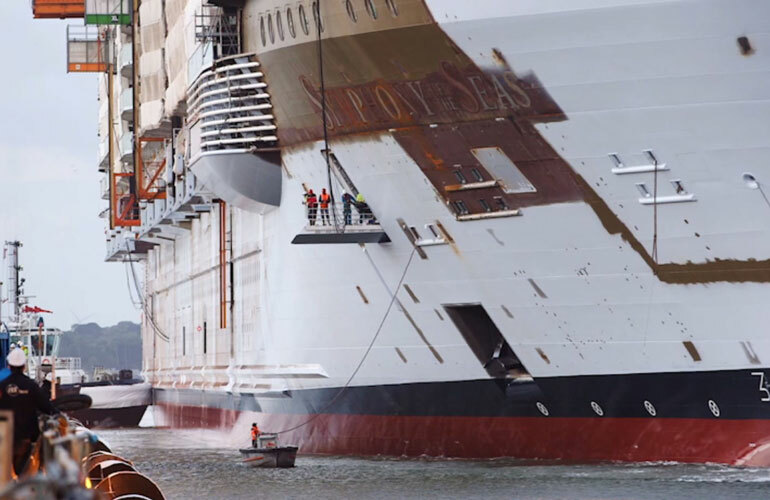 In a new video by Royal Caribbean, we get to know the very latest on Symphony of the Seas which is currently under construction at the STX France shipyard. The schedule of the ship is right on time and workers are busy getting the interior spaces completed. Just recently the exterior construction was completed and Symphony of the Seas floated out onto the water for the very first time. As mentioned in the video above the cruise line and shipyard is working hard getting everything ready for the maiden cruise on April 21, 2018, our of Barcelona Spain. The fourth Oasis-class vessel will sail a week-long Meditterreanen cruise and will also begin sailing from Miami, Florida in November 2018. Symphony of the Seas will include features similar to previous Oasis class ships along with a couple of new ones which have yet to be revealed. We’ll just have to wait and see what the cruise line comes up with. Symphony of the Seas will become the new world’s largest cruise ship at 230,000 gross tons and carrying 6,780 guests at maximum capacity.